This year, the number of flowering plants in our main experimental plot (exPt1) dropped in half compared to last year. This might be due to the lack of a burn in the prior fall or spring. Plot 2 (exPt2) had about the same number of heads in ’16 & ’17. In exPt1, we kept track of approximately 72 heads. The peak date was July 19th. The first head started flowering on July 2nd and the last head finished up on August 21st. In contrast, we kept track of 1076 heads in exPt2, about 140 more than last year! The peak date for these Echinacea was a bit earlier, July 13th. exPt2 heads also started and ended earlier (June 22 – August 19). We harvested the heads at the end of the field season and brought them back to the lab, where we will count fruits (achenes) and assess seed set. 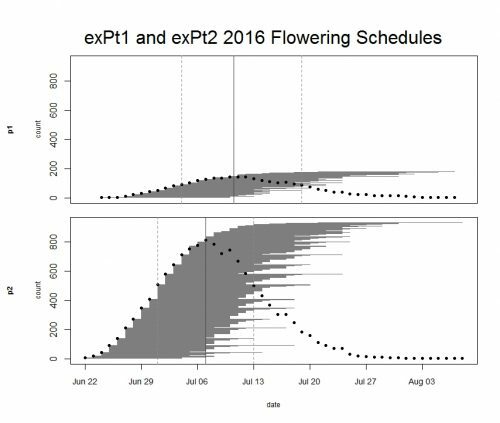 Flowering schedules for 2017 in exPt1 and exPt2. Black dots indicate the number of flowering heads on each date. Gray horizontal line segments represent the duration of each head’s flowering and are ordered by start date. The solid vertical line indicates peak flowering, while the dashed lines indicate the dates when 25% and 75% of heads had begun flowering, respectively. Note the difference in y-axes between the two plots. Click to enlarge! Physical specimens: Harvested heads from both experimental plots are in the lab at CBG. The ACE protocol for these heads will begin soon. Data collected: We visit all plants with flowering heads every 2-3 days starting before they flower until they are done flowering to record start and end dates of flowering for all heads. 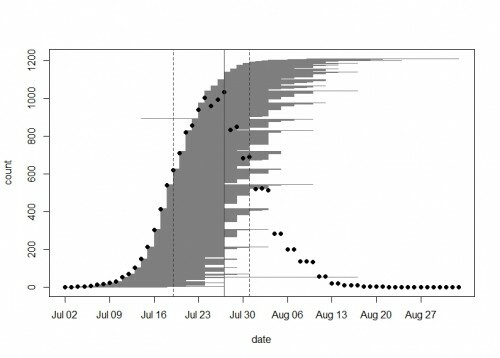 We managed phenology data in R and added it to our long-term dataset. The figures above were generated using package mateable in R. If you want to make figures like this one, download package mateable from CRAN! 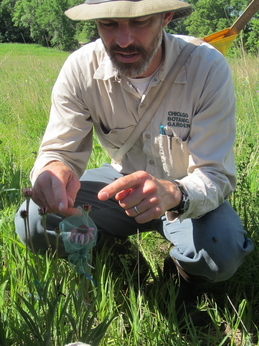 You can find more information about phenology in experimental plots and links to previous flog posts regarding this experiment at the background page for the experiment. Every year we keep track of flowering phenology in our main experimental plots, exPt1 and exPt2. Fewer plants than usual flowered in exPt1 in 2016: 149 plants (179 heads) flowered between June 24th and August 7th. The population’s mean start date of flowering was July 5th and the mean end date was July 18th. Peak flowering in 2016 was on July 10th, when 143 heads were in flower. For comparison, peak flowering in 2015 was on July 27th, when there were nearly 10x as many heads flowering as on this year’s peak. The earlier phenology and low numbers of flowering we observed this year relative to 2015 is likely due at least in part to the plot burn schedule (2015 was a burn year and 2016 was a non-burn year), but there were still many fewer flowering plants than any season, burn or non-burn, in the past 10 years. We kept track of 934 flowering heads in ExPt2, where the first head started shedding pollen on June 22 and the latest bloomer ended flowering on August 8th. Peak flowering was on July 7th, when 810 heads were flowering. ExPt2 was designed to study the heritability of phenology—you can read more about progress of that experiment in the upcoming 2016 heritability of phenology project status update. At the end of the season we harvested the heads and brought them back to the lab, where we will count fruits (achenes) and assess seed set. 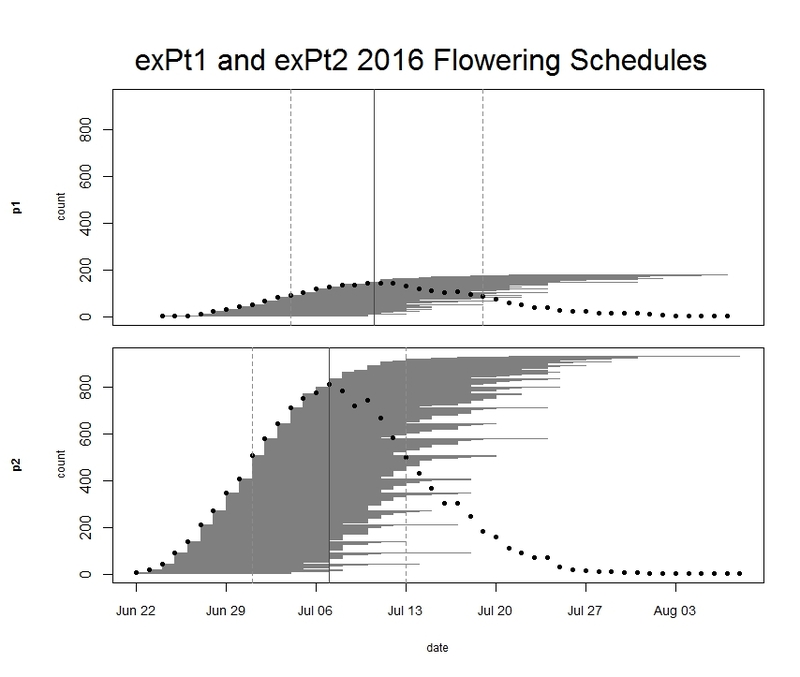 ExPt1 and Expt2 flowering schedules from 2016. Dots represent the number of flowering heads on each date. Horizontal line segments represent the duration of each heads flowering and are ordered by start date. The solid vertical line indicates peak flowering, while the dashed lines indicate the dates when 25% and 75% of heads had begun flowering, respectively. Click to enlarge! Physical specimens: We harvested 177 heads from exPt1 and 870 from exPt2. Attentive readers may note that we harvested about 64 fewer heads than we tracked for phenology. That’s because before we could harvest many seedheads at exPt2, rodents chewed through their stems and ate some fruits (achenes). We recovered most of the heads that were grazed from the ground and made estimates of number of fruits lost due to herbivory, but we couldn’t find some heads. Arg. We brought the harvest back to the lab, where we will count fruits and assess seed set. Data collected: We visit all plants with flowering heads every three days until they are done flowering to record start and end dates of flowering for all heads. We managed phenology data in R and added it to the full dataset. The figure above was generated using package mateable in R. If you want to make figures like this one, download package mateable from CRAN! Every year we keep track of flowering phenology in our main experimental plots, exPt1 and exPt2. Summer 2015 was a big year of flowering in both plots, especially in exPt2, where 1233 heads flowered between July 4th and August 26th. 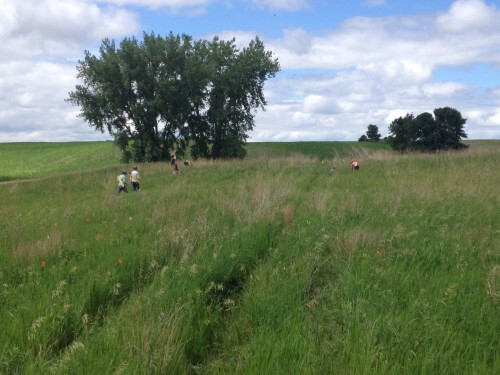 ExPt2 was designed especially to study phenology—you can read more about the team’s monitoring of phenology in the 2015 heritability of phenology project status update. In exPt1, we kept track of 1212 heads on 649 plants (we left out the qGen_a ‘big batch’ cohort). The first head began shedding pollen on July 2nd and the latest bloomer shed pollen on September 2nd. Peak date in exPt 1 was on July 27th when there were 1034 heads flowering. At the end of the season we harvested the heads and brought them back to the lab, where we will count fruits (achenes) and assess seed set. A plot of the 2015 flowering schedule in experimental plot 1 made with the brand new R package mateable–available now on CRAN! Each horizontal gray line segment on this plot represents the flowering time of one head. From bottom to top they are sorted by start day. Black dots show the number of heads in flower on each day. The vertical lines show the peak day (solid) and the days when half of the plants have started flowering and half have ended (dashed). Experimental plot 1 (P1) encompasses 11 different experiments originally planted with a total of 10673 Echinacea individuals. These experiments include long-term studies designed to compare the fitness of Echinacea from different remnant populations (“EA from remnants in P1”), examine the effects of inbreeding on plant fitness (“INB” and “INB2”), and explore other genetic properties of Echinacea such as trait heritability (“qGen”). 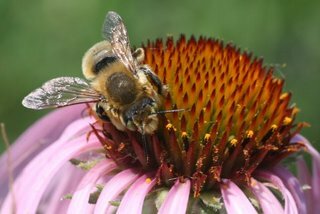 In 2014, Team Echinacea measured plant traits for the 5409 Echinacea plants that remain alive and followed the daily phenology of 567 flowering heads. Echinacea began producing florets on July 1 and continued flowering in P1 until August 24. The data collected in 2014 will allow us to estimate the heritability of various traits and assess the lifetime fitness of plants from the numerous experiments. Phenology in Common Garden & 1st Day of Dichanthelium Seed Collecting! Hi everyone, Maria here again. Today was a particularly happening day in my opinion. Everyone had something to do. Amber E. is back from Alaska with Ruth! Karen arrived from Evanston in the afternoon! In the morning those of us who hadn’t finished our Stipa searches in the common garden finished that! (So Stipa is done! – we scaled back though and only searched for the 2011(?) cohort). After that Gretel, Ruth, Amber E and I put Position/Row signs in the common garden and made the signs face East/Westwards so now it’s so much easier to read the signs while you are walking in the common garden. Then we got started on looking at the phenology of Echinacea in the common garden. 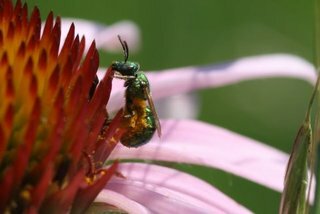 We systematically walked through each row, looking out for flowering Echinacea with emerged anthers and pollen, twist-tying the heads and recording them in our visors. Josh joined us when he finished his Stipa searches. We found quite a few flowering heads – bet there’ll be more soon. While we were looking for flowering Echinacea, we saw Stuart, Callin, Amber Z and Nicholas crowded around ‘Joe’ – the pet name given to the prominently flowering Echinacea at row 28, position 860. As described by Callin in the previous post, they were practicing bract-painting for their independent projects on Joe. When we finished looking at all the rows, it was time for lunch and short presentations of our projects. It was good to hear about everyone’s projects and talk about my own projects and get feedback. After lunch, we got started on our independent projects or worked on the New Media Initiative. Gretel and I headed to Hegg Lake to look for Dichanthelium (Panic Grass) seeds for my second project. This summer I will be collecting seeds from Dichanthelium plants from different remnants, including Hegg Lake and Loettler’s Corner (I might not have spelt that right – sorry). My plan is to collect seeds from 30 individuals from each “site”, as there are several places at Hegg Lake that seem to have a lot of Dichanthelium. After collecting the seeds, I will be bringing them back to Chicago Botanic Garden and do more work on them in the fall/later. I am super super indebted/thankful/grateful for Gretel. Without her guidance, I’d probably be in a big mess/not knowing what to do/still be at Hegg Lake as this is my first time doing independent field work. When we reached the place at Hegg Lake (it was near the road, area with ditch, south of the parking lot), a lot fo the Dichanthelium seeds had already fallen off the culms. It was quite disheartening. We walked a little north and found a patch of Dichanthelium with most of their seeds intact, then we laid out the tape measure for 20m in a roughly north-south direction (I kept thinking it was 2m while Gretel patiently corrected me ^^;;). Initial plan was to do every plant within arm’s length from transect, or every other plant if population was dense. However, that was not quite possible given the circumstances. After Gretel and I collected seed from the first plant and did all the measurements, she continued measuring/collecting while I picked ~30 plants near the transect (more than my arm’s length) that had at least one culm with 8 or more seeds to collect from and flagged them with a blank flag. I started measuring/collecting after I finished flagging. Around 4pm, Lee called – reinforcements were coming! Ruth and Lee arrived with Karen and they helped us finished the rest of the plants (by that time Gretel had completed 17 plants (!!) and I was on my 6th plant). It turned out that we had 31 flags so 31 envelopes with data and samples! We also collected some “random” samples – ie seeds from various random plants away from transect. Finished around 5pm – thanks to Gretel, Lee, Ruth and Karen! Really excited to get the first 30 done! We left 11 flags (labelled with sample number) at the site that we will return to later to collect more seeds from. Now that I have more experience, I’ll definitely be more systematic+efficient about it. – “just-in-case” extras (extra equipment, envelopes, pens, sharpies, flags) do come in handy! Meter sticks are probably more efficient than tape measures. More flags would be good. Maybe use a different color for “done” or for extras. – Extra samples are good too. Maybe do 32 plants per site? – Bring a plastic bag/something to put a plant specimen in – I need to get a sample of the other Dichanthelium species (“hairy leaved”) to press and identify. – Equipment list would be useful esp when I have more than 5 things to remember. Thanks again to Gretel and everyone who helped! 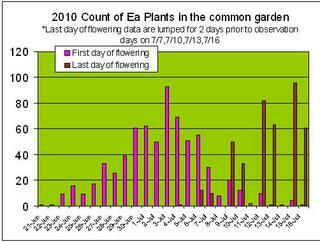 This graph summarizes the First and Last Day of Flowering for Echinacea plants in the common garden. It looks like peak flowering was July 8, 2010. June 21, 2010 marked the start of Echinacea flowering in the common garden this year. As of June 28, 2010 113 plants had started producing pollen. Approximately 775 plants will flower this season with a total of 1062 heads. We will be busy keeping track of the first and last day of pollen production per plant. As you can see from the pictures above, the pollinators are back at work, too! This week we are going to make big dents in CG measurements and our independent projects. We will measure the CG MWF morning and TTH afternoon. We’ll start T & Th morning with Phenology assessments and end off each morning with time to work on independent projects. Afternoons on MWF will be devoted to independent projects. Be ready 8:30 Monday morning–with sunscreen on & visors synced–for a pep talk (it’ll be about efficiency & the well-oiled machine)! Monday     measure CG        ind. proj. Wednesday  measure CG        ind. proj. Friday     measure CG        ind. proj. The common garden hit peak flowering status on July 13, 2009. 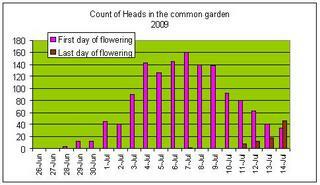 The graph below shows how many heads have started and ended flowering each day. Approx. 197 heads have yet to shed pollen of the 1,614 found.